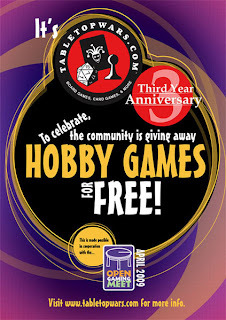 In celebration of the Third Year Anniversary of TabletopWars.com this April 2009, we will be giving away tabletop games for free in cooperation with the Open Gaming Meet. Whoever is drawn in the raffle will be checked if they meet the Winner criteria below. Only one (1) prize is allowed per person. Prize must be claimed by the winner in person at the April 2009 OGM Event. This means the winner's name should also be listed in the April 2009 OGM Guest Log Book. Please know that the prizes are a mix of brand new/sealed items and used ones but in good to excellent condition. We are also accepting prize donations until March 21, 2009. The donated prize(s) will then result to succeeding draws but will have the same criteria as the BRONZE WINNER. The Pool of Prizes will be updated as soon as we receive any prize donations. If you want to donate a prize, please send me (the Administrator) or Rolf (the Global Moderator) a Private Message (PM). You can also send an e-mail message to webmaster@tabletopwars.com. We may need to collect the item(s) first before your donation will be included herein. We will only accept games with complete components and in good to excellent condition or brand new. Everyone can join (except the TW Administrator - Brel) as long as they meet the criteria for each winner category. But a person cannot win any games that they have donated themselves. If ever a rare scenario happens and the last remaining prize is the donation of the last winner, he has the choice of either getting 500 worth Kredz Certificate as replacement for the item or just making another draw to give away his prize to another person. As long as a participant has shown up in the OGM at least 3 times in an 18 month time span, with the count starting at January 2008 - and has contributed to the OGM those three times, usually via the "entrance fee" - he/she will be awarded a NEW OGM ID. Therefore, people that have shown up at the OGM just to "watch" and did not contribute to the OGM are not "credited" towards getting a NEW OGM ID. To summarize, you are only eligible to be a GOLD WINNER if you have the NEW OGM ID and a TW website account otherwise you have the chance to only be a SILVER or BRONZE WINNER. If you need to check if you already have the new OGM ID and the correct Sticker Badges, please click here to see the list. To request for a TW Sticker to be placed, please send Private Message (PM) to Victor Kh'BaHzur, Rolf (TW Global Moderator), or Brel (TW Admin). Please be ready to give your TW Username and real Full Name. The raffle draw will be made live at the April 2009 Open Gaming Meet (OGM). If a person is not present when their name/handle is called to claim the prize at the April OGM Event, their prize will be forfeited and another drawing will be made as replacement and so forth until a winner successfully meets all criteria. The OPEN GAMING MEET (OGM) is a monthly informal gathering of various tabletop game enthusiasts and casual gamers to try out various related hobbies that they normally don't have the time or resources to commit. Every OGM will have a varied offering of Board Games, Party Card Games, Trading / Collectible Card Games, Miniature War Games, Traditional / Classic Wargames, and select One-Shot Role-Playing Adventures courtesy of said tabletop game enthusiasts. Anybody interested in the hobby or just want to experience something different are welcome to join! To learn more about the OGM, visit the ff. link: http://www.tabletopwars.com/bb/index.php/topic,4284.msg14730/topicseen.html#new Below is a map of the new OGM venue starting April 2009 (also our Raffle date). Click thumbnail for larger version. Thanks for all your support! It is time we give something to all our valuable members, hobbyists, and newbies. Please Feel free to spread the word about the raffle and use this chance to invite more people to the upcoming OGM! What a cool game. I bet my friends would love to play it. By the way, did you know that Herobits, an upcoming card game will be released on June 2009? It's like playing like a superhero. I'm pretty sure you gonna enjoy it. HEROBITS: Thanks for your comment. I'd like to know more about Herobits. Sounds interesting! BTW, did you go the OGM?